Funko Pops - love ‘em or loathe ‘em - are huge right now. When it comes to the four-inch collectables, people fall into one of two categories: those who have amassed an epic collection of iconic characters and are obsessed with getting more... and those who shrug in bemusement over what the big deal is. But there’s far more to the Funko craze than fans spending hard-earned cash on their favourite fictional and real-life heroes - they’re big business, especially with serious collectors. Some ranges, admittedly, aren’t particularly sought after, but others become incredibly rare and, as a result, proverbial gold dust. If you’re interested in what’s been vaulted (the process whereby Funko stop producing an individual figure), has become incredibly rare, or, as per Steve from Stranger Things, has rocketed in value for reasons presumably to do with his amazing hair, then you’re in the right place because I’m about to run down the list of the top 10 rarest and most expensive Funko Pop Vinyls on the planet. You’d best sit down for this one. Released earlier year and exclusively available at SDCC and Toy Tokyo, this shiny and rather lovely looking version of The Dark Knight got collectors in a frenzy. Originally available for the price of an exclusive Comic Con Pop (around the £15 mark), it’s since rocketed in value. It’s now valued at a staggering $470 (at time of writing), but eBay is where the eye-watering sales take place: on average, a mint in the box Batman (Blue Chrome) shifts for £300-400. Holy smokes! Anyone growing up in the 1980s will have been into the camp cartoon heroics of He-Man and co. Both he and nemesis Skeletor are rare finds themselves; commonly fetching in excess of £100 each. But it’s the San Diego Comic Con 2013 version of the villain that collectors are in search of. With only 480 produced, it’s currently valued at $470 (£347) with just a single one having been sold on eBay for over £400. Be sure not to confuse any of these vaulted or rare versions with the 2017 line of Masters of the Universe Funko. Star Wars fanatics are synonymous with collecting extraordinarily expensive pieces of memorabilia, and the SW Funko community is no different. The first of two franchise entries is bounty hunter Boba Fett in a different-to-the-movie costume. Another 480 limited edition run, this particular look is from Droids - the TV show following the adventures of C-3PO and R2-D2. Its value? A planet-shattering $500 (£369). Prices are understandably high at online auction sites, typically ending on £300-500. As with Fett collectables, this one’s likely to increase in value with time, so maybe this is a sound investment after all? What the heck, go and buy two. 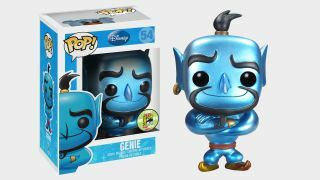 The late, great Robin Williams made the Disney version of the lamp dweller an icon, so it feels fitting its Funko model is up there as a valued addition to anyone’s collection. The metallic versions are often worth many times that of its standard release, and this is no different. There’s something dazzling about this, and it was no surprise to see it fly off the shelves at SDCC 2013. While its value is estimated at $580 (£528), you may be able to nab one off eBay for as little as £380 - bargain! There’s also one available on Amazon for a toe-curling $600. Another metallic release and another huge price tag, Batgirl is one of a number of rare DC Universe editions comic book fans are desperate to own. Only this time, instead of the typical limited edition Batman, it’s Batgirl leading the way and, get this, she’s not even from a Comic Con event or vaulted away. This Chase version (meaning a variant of standard releases) from an ever increasing, extensive DC line is ultra rare, so expect to fork out about a month’s rent for the privilege of ownership. In October, one sold on eBay for £869. And just last week, some lucky buyer acquired one for £745. This is the point where the list passes the $1,000 threshold, so where better to start than the ultimate Thrones grail piece. Ned’s infamous demise at the hands of King Joffrey signified the horrors of having our favourite characters killed off, so what better tribute than a Pop with his head lobbed off? 1008 headless Neds were made and despite finding a handful of custom jobs for under £100 on eBay, the real deal (complete with SDCC 2013 window sticker) fetches just over £800 and is currently valued at $1,220. Bankruptcy is coming. Toy Story 3 was an amazing end to the (then) trilogy, with Lotso proving a worthy adversary to Woody and the gang. Despite the standard 2011 rare, vaulted Lotso now worth $140 (£103), it’s the flocked version (a furry variation that replaces the standard plastic) that’s most hunted in the entire Toy Story line. You’d better start saving because it’ll set you back $1,300 (£959). Even the most hardened collector will seriously struggle to find one of these online unless it’s bought privately. But anyone who collects flocked Funkos can attest to how nicely they display (and feel). No one was particularly thrilled - least of all actor Ryan Reynolds - when the 2011 film of the same name bombed at the box office; yet the Glow in the Dark edition from SDCC 2010 has an incredible estimated worth of $1,670 (£1,233). Aesthetically it’s an appealing piece, and that’s taking into account the magnificent-looking metallic version of Sinestro, that’s worth around $270. This Lantern’s price is largely down to its holy grail status after only 240 were made available. Attaining one is as likely as finding a solid joke in the film. So impossible, then. As all Dragonball Z fans will know, there are plenty of difficult to find variants (notably the number of Goku available) to hunt down, such as a red-eyed Golden Frieza ($175), but most can only dream of owning this sort of grail; after its exclusive NYCC and Toy Tokyo release in 2014. Beware of the damaged and custom ones that scatter eBay, though - the real deal last sold in mid-November for £1,566 and you won’t find the genuine article for less than £1,400 - if you manage to, then you’ve nabbed yourself a bargain. Who would’ve thought that the funnily face-painted baddie from arguably the worst Star Wars movie would be so in-demand? Not only is this the holographic version (which looks pretty cool in terms of the holographic lines Funko produce), he’s also Glow in the Dark. Even though Maul first appeared in 1999’s The Phantom Menace, this didn’t see the light of day until SDCC 2012. With a value of $2,460 (£1,816) and eBay’s last sale in September going for over £1,800 (and that was slightly damaged), it’s a very tough one to find, especially in totally mint condition.